I’ve noticed some people have started following this version of the blog; just a reminder, I’m no longer posting updates here! You can find me at www.threadpanda.com from now on. Thank you!! Hello friends! Just a quick note to say that I am knitting, just not really photographing much and forgetting to talk about things in general, but more importantly, this week’s Friday Finds and all other posts from here on out will be located at www.threadpanda.com. That’s right, this panda has her very own domain now. I’m still tweaking some things—it’s completely, sadly missing a links list, for example—and will be undergoing some cosmetic changes in the next few weeks as well, but I can’t wait any longer and I wanted to share the news with all of you! So please, update your bookmarks if you have them! This site will remain live indefinitely, but all new content (and all old content as well) will be over at www.threadpanda.com. If you subscribe to this blog via the email list, please provide some feedback—do you like receiving the emails? The new site has an option for RSS feeds, if that’s more your game. I don’t think there’s an easy way to migrate the current mailing list to the new site, unfortunately. So that’s that! I’d love to hear what you all think of the new site over at www.threadpanda.com! Happy New Year to you all! First Friday of the new year calls for something a little extra special, don’t you think? You probably all realize that I’m a big nerd and that I’m in love with The Hobbit: An Unexpected Journey, so I dedicated this week’s Friday Finds to Tolkien-inspired patterns. YOU’RE WELCOME. 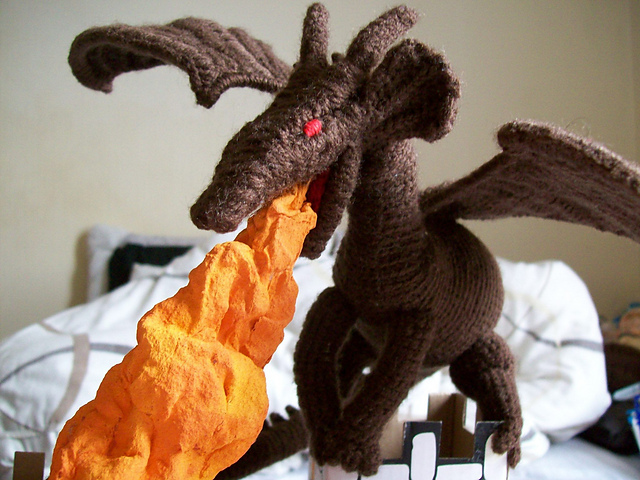 I like to pretend that Antoniya Petkova’s Magnificent Dragon (£4) is Smaug in disguise. Yes I do. 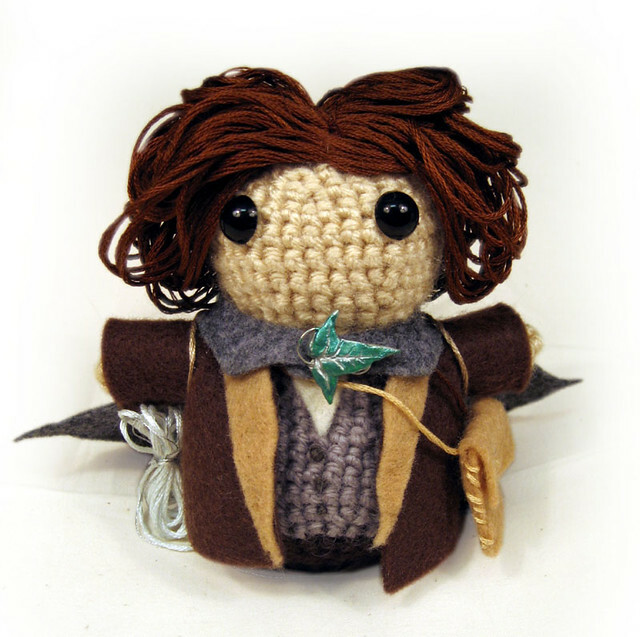 You can crochet all of the hobbits (free) thanks to Sammi Resendes’s pattern. I love the little leaf on the cloak! Erica Jackofsky’s put together an entire collection of Tolkien-inspired patterns in her A Hobbit’s Journey eBook ($18). I especially love Ori’s Cowl, Rivendell Shawl (pictured), and the Lord of the Eagles shawl. If you knit Josie Mercier’s Pocketses (CAD$4.50), be sure to not get stuck in any tight spaces that might send the buttons flying. Smaug (free) by Frau Morag are dragon-scaled socks. Perfect for wearing on an adventure. Claire Ellen’s There and Back Again eBook ($14) features three fantastic sock patterns, including the beautiful textured Gollum Socks. 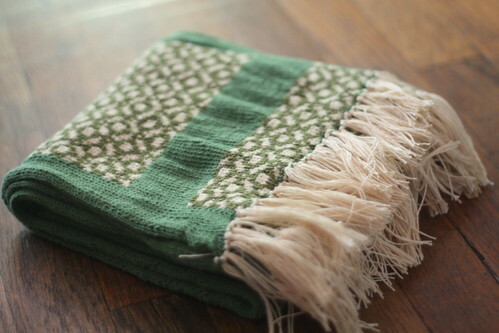 Take your devotion to new levels with Diana Stafford’s One Ring Scarf (free). 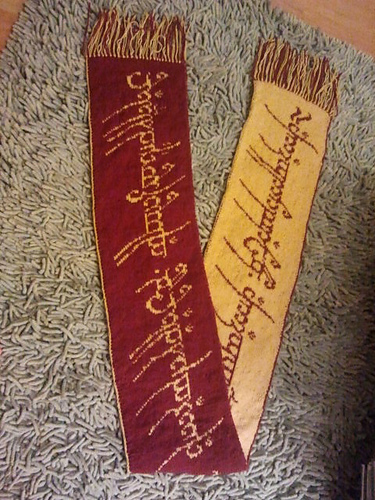 This reversible scarf features a double-knitting chart with the Elvish inscription from the Ring. 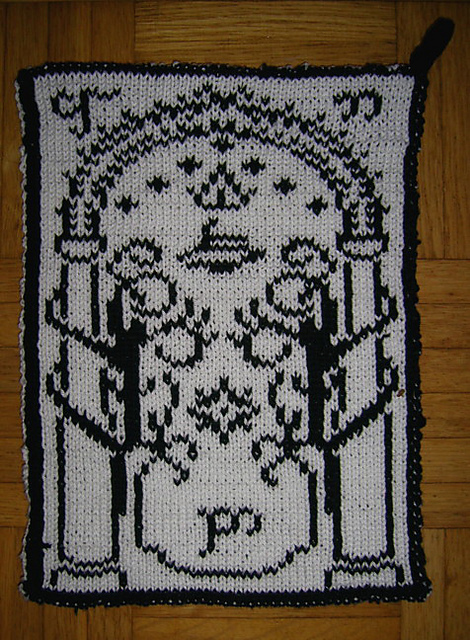 Andrea Krüß-Anders’s Doors of Durin chart (free) is another double-knitting chart. No, I am totally not planning to work all of these (plus the following chart) together into something. 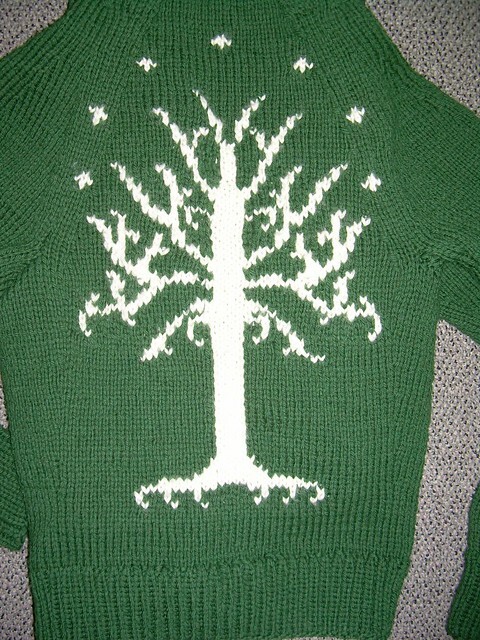 True story: My new cell phone case with the Tree of Gondor should arrive any day now. Less protective but equally awesome is Emma Schurman’s Tree of Gondor chart (free). The Hobbit photo comes from TGDaily. All project photos are taken from the individual Ravelry pattern pages unless otherwise noted. No copyright infringement intended. Very belated today—sorry about that! I was running around New York City and didn’t have a chance to run the random number generator. Marion! Marion, I’ll be in touch with you about your prize pattern soon—remember, you can choose any pattern that’s available online for under $7—your prize does not have to come from last week’s Friday Finds. Thanks for playing everyone, and I hope you have a wonderful New Year’s Eve. Goodbye 2012! Overall this year pretty much balanced out between good times and less good times, but the back end was definitely overloaded with crap, and created situations that are unlikely to improve any time soon, so I’m not particularly looking forward to 2013. 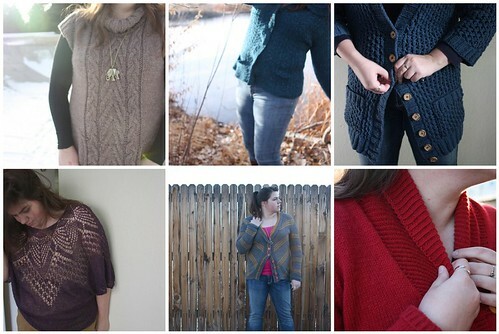 Knitting-wise, this was an incredibly productive year. 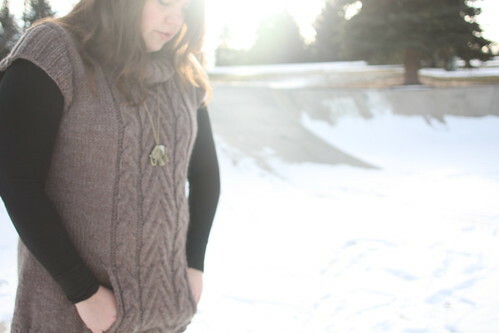 Without planning to, I knit six garments for me that worked out (and one that didn’t). And as you saw in the last Sweaterday post, I’m a little more than halfway finished with another one. This is the first year I’ve churned out this many sweaters since the original launch Sweater Odyssey a couple of years ago. And this was mostly accidental. I’ve got a good amount of yarn queued up to knit a few more sweaters and cardigans next year, which is awesome, because sweaters get rid of a lot more yarn than socks do. I did knit three pairs of socks this year, in addition to six shawls/scarves and a few hats (one of which still needs to be sewn together, oops). Quite a few baby projects were made for a few babies who debuted this year. Oh yeah, there was that Loki scarf too. I had a goal to not buy much yarn to help save money for my trip to Paris, and while in general I did pretty good with that—didn’t really impulse buy much yarn—I did keep buying yarn to knit those sweaters. And I knit them up pretty much as soon as the yarn appeared. So that’s good. But next year, I really need to buckle down and knit from my stash and not add to my stash via my own means (meaning, if someone sends me yarn as a gift, obviously I will accept it and love it, and I can buy yarn for other people, but I can not buy yarn for myself). I have a ridiculous number of pattern + yarn-in-stash match-ups and I need to work through the queue. Knit from the queue. I only finished around 25 projects this year (partly because the Loki scarf did take up a bit of time—I figure next year I could knock out about thirty projects, depending on the size and complexity). I have about 140 patterns matched to yarn in my queue. I’m set for a while. Don’t buy yarn. I obviously don’t need any yarn. I have enough projects to keep me entertained from here to the next apocalypse without fail. Pretty simple, really! Here’s hoping I can stick to them. Are you making any crafting goals for the new year? So it’s a day early, but I want to talk about the year in review tomorrow, so I’m posting this today. December was a good month, knitting wise! 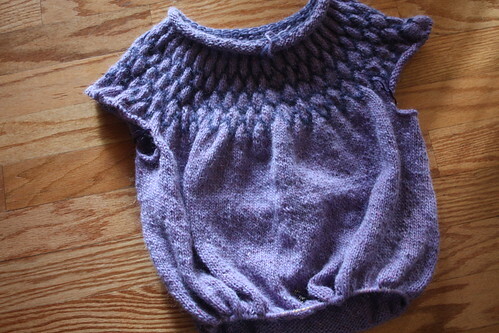 And, you know, almost finished the body of another sweater. I’ve turned into a sweater knitting machine. I haven’t knit a sock in a good long while. I’m no tsure who I am anymore. 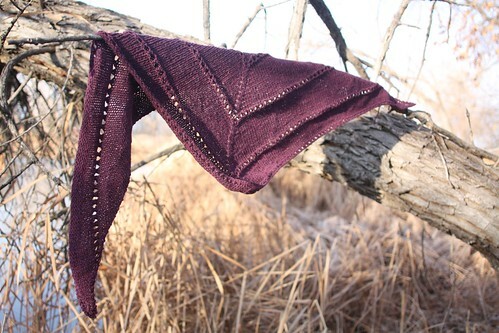 Finally photographed my Age of Brass and Steam shawl and shared that with you. I also knit a couple of panda bonnets for a few wee ones in my life. And there’s one more I need to knit as well. I’ve been working on a swap project, so I can’t update you on that at all at the moment, but it’s nearly finished and due to be mailed out in a couple of weeks, so you’ll see it soon enough. We had a contest every week this month as part of the Friday Finds, and I really enjoyed hearing from everyone about what you liked each week! I have bought some yarn this month—enough to knit the rest of my I∂unn sweater, and three skeins of Madelinetosh Tosh Vintage for the Puff Stitch Crochet-along we’ve got planned for the new year. I’m really going to try to not purchase any yarn in 2013, but that’s a discussion for tomorrow’s post. So that’s pretty much my December! It’s been a productive and fun month, in terms of making things, and here’s hoping that continues into next month. I made a lot of progress on my I∂unn sweater this week. I brought four balls of yarn (which miraculously arrived the night before I left—a mailperson dropped them off around 7 PM, well after my regular mail had been delivered—I’m not sure what happened there), and knit all four of them, which amounted to a great deal of knitting being accomplished. 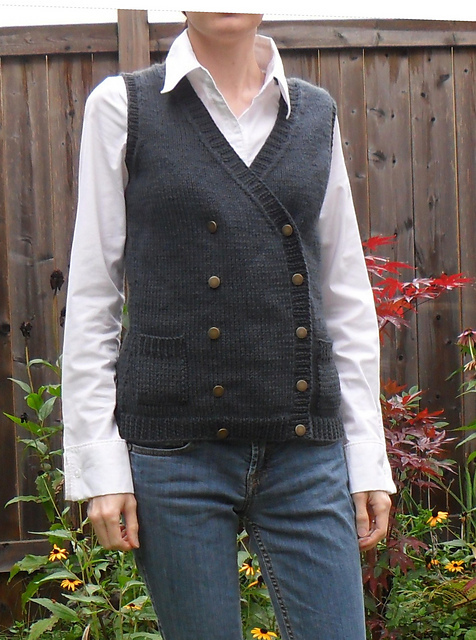 I added some waist shaping, which is missing from the cardigan, working three sets of 4 stitch decreases and increases that begin about an inch below the divide for the arms. I placed the back increases and decreases on the back, not along the sides of the body, which I think makes for a slightly more flattering fit on me. I’m really close to starting the ribbing at the bottom—I may have that to show you next week, but since I ran out of yarn, I shipped the sweater back to myself, along with some Christmas presents I’d received, so it all depends on when that box arrives and how much I’m able to knit before next Saturday. Today’s the last Sweaterday for 2012! I hope to be able to continue posting regularly on Saturdays for a while in the new year, as at some point I’ll be working on Heidi Kirrmaier’s Rain Dance as part of the Sweater Odyssey knitalong. But now I’m going to go play in Central Park.